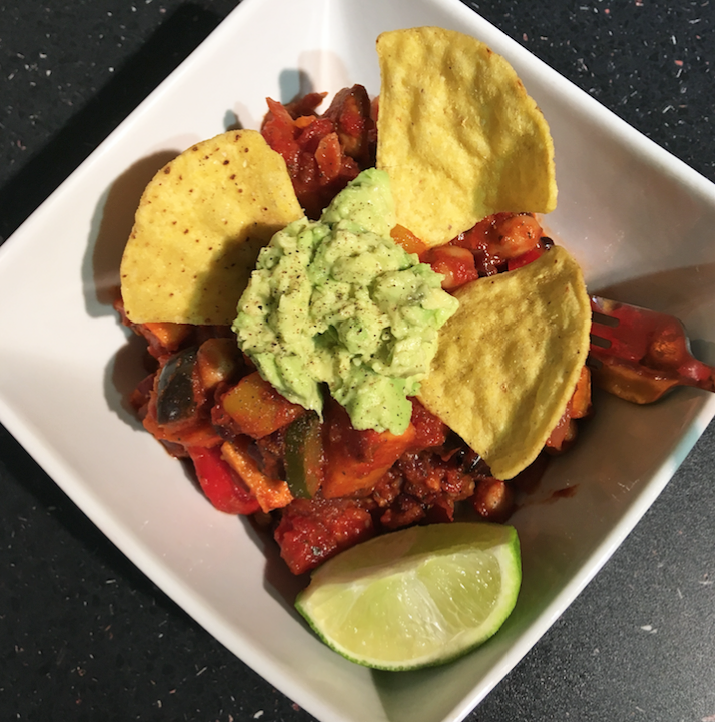 Smoky, warming and satisfying, this chilli is packed full of veggies and beans, making it a nutrient powerhouse, rich in fibre, protein and so much goodness! Not only that, it tastes amazing and is great for leftovers – which always taste better the next day, right?! Adding in the roasted aubergine and sweet potato is a game changer, and the generous amount of smoked paprika really adds a depth to the flavour. To serve: brown rice, avocado and tortilla chips if you fancy! 2. Chop the sweet potato and aubergine, pop on a baking tray and roast for 15-20 minutes. 3. In a large saucepan or wok, sauté the onion and garlic until soft. Add the other vegetables and cook until also soft. 4. Rinse and drain the beans and add to the vegetables along with the chopped tomatoes, tomato puree, herbs, black pepper and spices. Mix it all together with the fresh lime juice and add water to loosen the mixture. 5. Once the sweet potato and aubergine are soft, add to the chill and simmer the pot on a low heat for 20 minutes, until the vegetables are all cooked through. 6. Serve with fresh coriander, brown rice and chopped avocado – and tortilla chips if you’re pushing the boat out!